Sometimes I see new biscuits and I get excited, sometimes I see new biscuits and I get a wave of "why". These new biscuits fit into the latter category. It has actually been a while since I last went to Waitrose so we felt obliged to have a look at their new own brand products. It was Spectre that spotted this particular creation and I spent a few minute looking at the box thinking that I really didn't fancy them. One of my friends is a firm believer that Shortbread should be plain, its mild buttery flavour being the whole point of the biscuit. 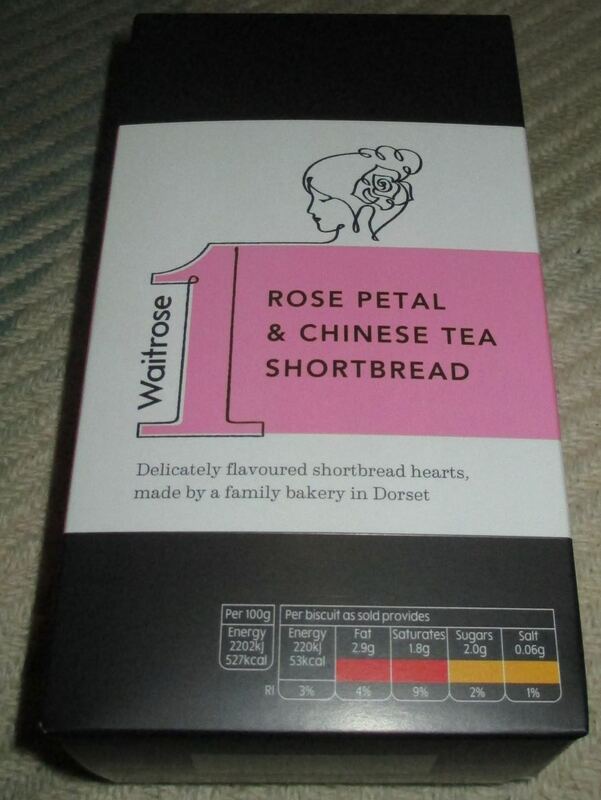 I do understand this, so lacing my biscuit with both rose and china tea just didn't appeal. Still for the sake of Foodstuff Finds I forced myself to buy and try this particular packet. I know, its a hard life blogging. Inside the box I discovered that the shortbread biscuits were heart shaped and as such would make a nice stocking filler. 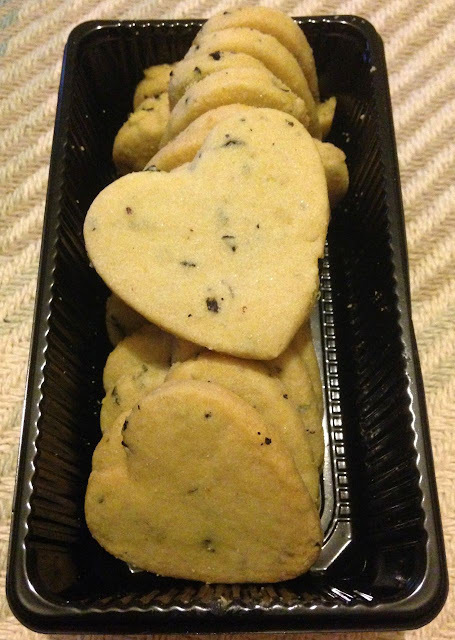 You can see the Chinese tea leaves in the shortbread, but fragrance wise the biscuits smelt simply quite buttery. This was true of the taste too, it was delicate and floral and if I'm honest barely noticeable. For me this worked, but bear in mind I wasn't keen on the strong sounding ingredients to start with. There was gentle flavour of sweet rose, and the tea added a light herby taste, but again it was very mild. The tea was not very noticeable in terms of texture either, it felt smooth apart form very occasionally when you would notice a little bit of firmer leaf. Spectre even liked these biscuits and he hates rose flavours. So in some respects I can see people being disappointed with the mild flavours, but they are easy going and still manage to maintain all the buttery goodness of shortbread. Perfect with a delicate cup of tea, not perfect if you were after some stronger flavours.